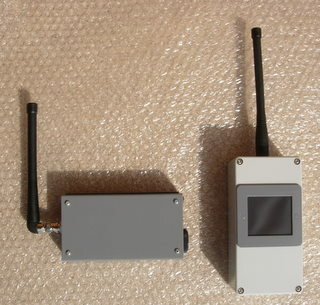 GSM Gateway Alarm. Sends text messages when triggered. A GSM-enabled Gateway Alarm incorporating our renowned FarmGuard Gateway Alarm and our superb GSM dialler. The receiver and GSM dialler are located somewhere reasonably secure and dry, and the weatherproof PIR sensor / transmitter is located anywhere up to 400m away. The system is armed and disarmed either by text message, remote control keyfob, or with a plug-in timer. Once armed, anything crossing the beam will trigger the system and cause text messages and voice-calls to be sent to up to ten phone numbers. Supplied with a Vodafone SIM card (other networks available on request at no extra charge).